Russian customers appreciate outlets more and more, according to the exit polls conducted by Vector Market Research on behalf of FASHION HOUSE Outlet Centre Moscow. 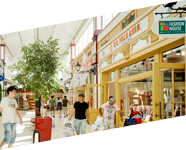 They tend to visit outlet centres more regularly and spend more time than they did last year. Nowadays, FASHION HOUSE Outlet Centre Moscow is full of men, women and children, enjoying the London and Milan-themed scheme, with only a handful of shoppers visiting on their own. 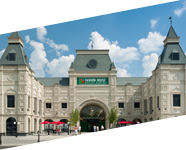 Opened in June 2013, FASHION HOUSE Outlet Centre Moscow is the first fully enclosed outlet centre in Russia. In less than 2 years it became one of the preferred shopping destinations among the inhabitants of the Moscow City and the nearby region. According to the survey conducted in December 2014, 7 out of 10 of the sample of visitors to FASHION HOUSE Outlet Centre Moscow are already returning customers and 55% of those clients declared to visit the scheme regularly – at least once per month. Moreover, respondents appreciate regular development of the scheme’s retail and entertainment offer and spend more time and money in FASHION HOUSE Outlet Centre Moscow. Compared to the previous survey in 2013 the percentage of shoppers who stayed in the centre between 2 and 3 hours more than doubled and the number of customers who spent more than three hours almost tripled. Average spending increased by almost 40%. One of the most distinct indicators that Russians like shopping at outlet centres is their overall shopping satisfaction. 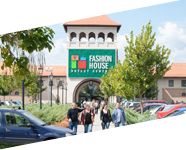 According to the survey, more than 80% of respondents found something they wanted to buy and an even higher percentage intend to recommend FASHION HOUSE Outlet Centre Moscow to their friends and family. Those recommendations of users remain the most important element in spreading the ‘word of mouth’ message that outlet shopping is a new way to shop and save in Moscow these days. According to the study, high quality fashion items, famous brands, attractive prices and wonderful architecture are the main reasons why FASHION HOUSE Outlet Centre Moscow is being appreciated by customers. But there are also two important external factors improving popularity of FASHION HOUSE Outlet Centre Moscow – infrastructure improvements and rapid devaluation of rouble at the end of 2014. The opening of the new M11 highway has taken away traffic from Leningradskoe/M10, making FASHION HOUSE Outlet Centre Moscow even more accessible for millions of Moscow City residents. At the moment, it can be reached within mere 30 minutes’ drive from the centre of Moscow. – The immediate improvement in price attractiveness of FASHION HOUSE due to the rapid devaluation of rouble at the end of 2014 increased the appeal to most customers. And once introduced to the benefits of outlet shopping, Moscow consumers typically became keen to use it more often. 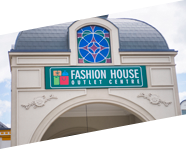 Nowadays, even with the recovery under way, we are seeing customers returning enthusiastically to the FASHION HOUSE Outlet Centre Moscow, as they seek to get more value from their spending on branded fashion – said Brendon O’Reilly, Managing Director of FASHION HOUSE Group. – After opening of the second phase of the scheme in 2016, we’ll add 24 new popular brand and drive further customers’ interest in FASHION HOUSE Outlet Centre Moscow – he added.